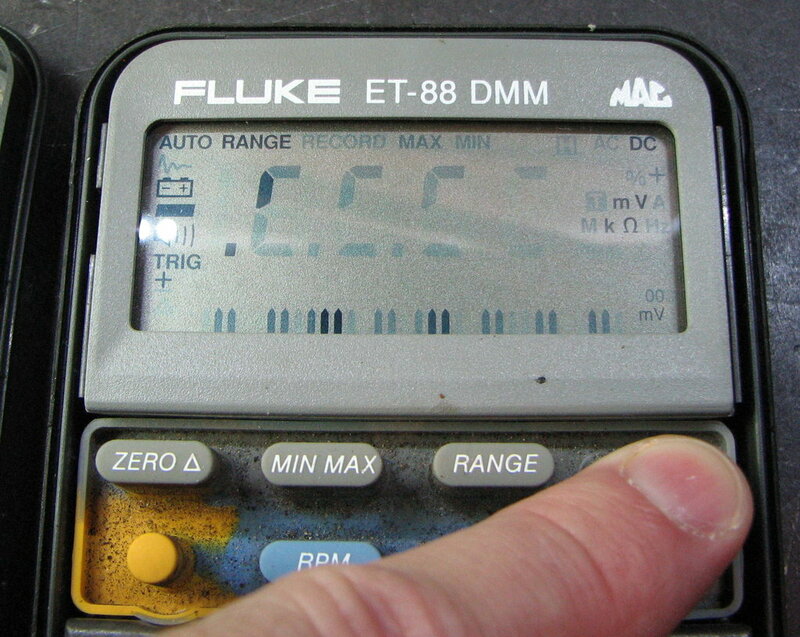 This is probably the single most common problem with older Fluke DMMs such as the 83, 85, 87, and 88 models. Referred to as “faded digits”, “faded segments” or “fading display”, it happens when the connections between the printed circuit board and the glass display panel become contaminated enough that the liquid crystal display (LCD) does not receive enough charge to flip all it’s little crystals around and become nice and opaque. LCD segments are essentially little capacitors, and are driven with a symmetrical bipolar AC signal to keep the average current at zero. This prevents building up a charge on one side, which is detrimental to the LCD. The RMS current is very small; this is what makes LCDs ideal for battery-powered devices. To bring the signals up from the PCB to the glass surface of the LCD, something called an elastomeric connector is used. It’s basically some conductive strips embedded in a flexible rubber-like material. The appearance leads to them being called “zebra strips.” A plastic support structure combined with either screws or clips are used to keep the connector under slight pressure, to maintain good contact and seal out contaminants. Metal-to-metal low resistance connectivity is not necessary because of the low currents, but if oils from the elastomer leech out, or other contamination invades the contact surface, it will reduce the signal enough so that some segments get dim. The 80-series display is multiplexed, so one single bad connection can dim a whole group of segments. 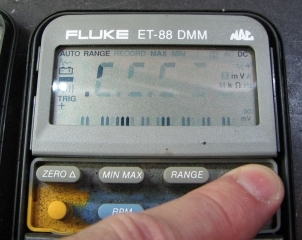 The pink elastomers that Fluke used in the early 80-series meters are known to have this problem, enough so that Fluke changed to a different gray-colored connector somewhere during the life of this product line. Replacing the old pink connectors with the newer gray type is the only solution recommended by some. The candidate pictured in this write-up is a Mac Tools-branded Fluke 88, with a very severe case of faded digits. Holding down any button while turning it on invokes the “all segments on” display test. In this case only a few segments come on with a reasonable amount of contrast, and there are a lot that can’t be seen at all. Let’s take this one apart and fix it. Remove the 3 screws in the back and take the case halves apart. Disconnect the battery and lift the meter assembly out of the case. Note that there is a top shield and a bottom shield held in place by a single screw in the back. Remove the screw and lift the rear shield starting at the bottom; finish by unhooking the “T”-shaped tabs at the top, taking care not to break them. The top shield is held on by four barbed clips under the corners of the display bezel. These clips are somewhat fragile, if you break one it will ruin your day. Start on the right side (looking at the assembly from the back) and release the two clips with as little pressure as possible. If your model has a backlight, there will be a 2-pin connector that must be de-mated. The board can then be slid out from under the clips on the other side. Detach the bezel by prying gently under the top edge (best to use a plastic tool.) The LCD should lift right out. Since the elastomeric connectors have been compressed against the glass for all this time, they should be securely stuck to the LCD, and will come out as well. It is best to put the connectors back in the same position and orientation they were in, so label them for that purpose. The supplies for the cleaning process consist of the purest isopropyl alcohol (IPA) you can find (91% or better) and a heap of Q-tips (cotton buds). Dampen one end of the Q-tip and roll along the edge of the LCD to clean it. Use the other dry end to remove excess IPA and the contaminants that get floated. When the Q-tip gets dirty, toss it and get a clean one. Continue until the contact surface is clean. Replace the LCD (don’t forget to check the orientation) in the display frame and clip the bezel back on. Now perform the same type of cleaning process on the edges of the connectors, using the wet end / dry end method. 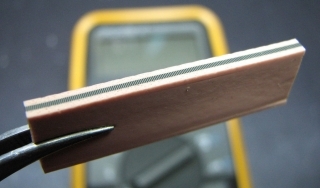 It is best to use tweezers to handle the connectors, because skin oils can contaminate the contact surface. Slip the connectors back into their original position and orientation. Use the tweezers to seat the connectors in fully. Set the display assembly aside. Again with the wet end / dry end method, clean the PCB contact pads. If the pads are metal and in really bad shape, a fiberglass scratch brush before the IPA/Q-tip cleaning can help. Some models have black polymer thick-film (PTF) contacts. Do not use anything more abrasive than the Q-tip on these. Almost done. Slide the PCB under the clips on the left side. Align the 2-pin backlight connector and gently press the assembly back together. It should not take much force at all, if it resists, then something is not aligned. Check everything and try again. When everything is seated properly, reattach the battery and turn the unit on while holding any of the buttons down. (A 3/16″ Allen wrench is handy here for turning the switch.) All segments should be nice and black now. If your meter is dirty, it doesn’t hurt to take the plastic parts and the keypad, and give them a good scrubbing before completing the reassembly. This entry was posted in How-To, Repair and tagged 80-series, DMM, Fluke, LCD. Bookmark the permalink. I have a rubbery polishing block from maplin electronics i bought donkeys years ago, it was for cleaning new pcb tracks prior to soldering, i use it to swipe over pc memory connections that are playing up, one swipe does not remove the gold plating. Your pictures make me feel im sitting right next to you… so how about a cup of tea then lol. Yes, good results in this case, but really I have found that to be typical. Now if the plastic bits are cracked/broken and it’s not holding things tight, then that’s another cup of tea. I like my tea with cream sugar and coffee, hold the tea. The polishing block sounds useful. I know some people say to use a pencil eraser, but I never liked that method much. I am a bodger, and when something has been pronounced “bin fodder” i can use all the rather nasty methods of test and repair i can think of to make it work again. I really enjoy reading the post even if i don’t have broken Fluke multimeters. Keep making such cool things. Thanks for the kind remarks. Good luck with your studies. After this repair my Fluke 87 from 1989 stays in display test after switching on. anybody out there have any idea? Sorry to hear you’re having problems. Don’t mean to insult your intelligence, but it has to be said, check the battery first! Make sure you got the LCD re-installed in the correct orientation. If that’s OK, check the switch mechanism on the bottom of the circuit board. 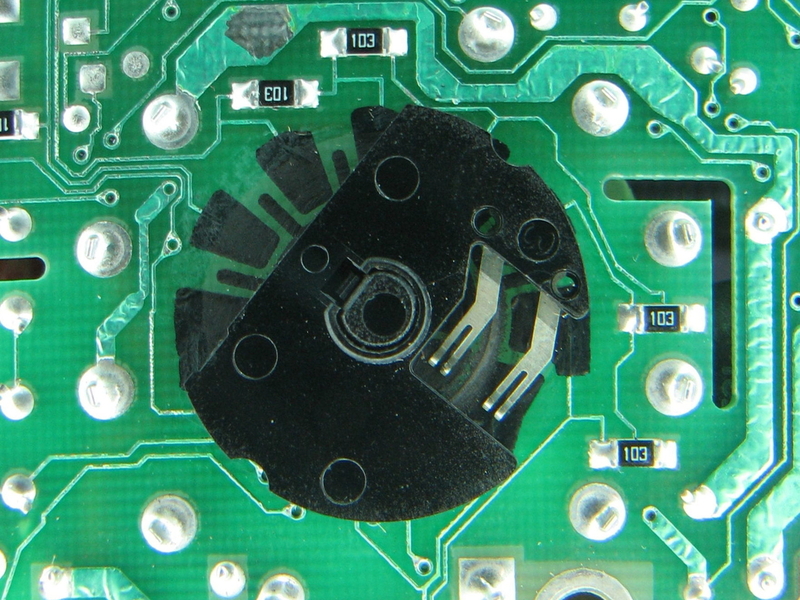 This is the ‘code switch’ with a plastic rotor over some black material on the PCB. It is responsible for powering up the meter and resetting it between function settings. Perhaps it is loose, has some foreign material in it, or something like that. Try a new battery or if this doesn’t work take the cover off the pcb board. Sometimes there is a short with the continunity (buzzer)function. you can either clean the connections or put it back without the cover. without the cover you lose the buzzer but a small price to pay. first of all – great job! Youre site gave me a lot of helpfull hints and solved a few problems with the sereies 80 DMM’s. But after cleaning the display contacts and reassembling ist, I have the same problem that Henk Kramer has. I checked the code switch, but I can’t find any problems. Perhaps yo have an idea??? If it was working before, then odds are it is something simple that may have been disturbed during the disassembly/assembly. A stuck button might cause it, so check the keypad and the associated PCB contact areas. And please if you find the problem, let us know. It concerns me that this procedure could cause negative consequences. For the answer I found to the staying on issue, please refer to my post below. Thanks! yesterday evening, I solved the Problem. I had two Fluke 87, showing the same error. After cleaning the contacts of the code selector, erverything was o.k. again. But what I don’t understand: before removing the display, everything was all right. And I didn’t touched the code selector and there was no dust, grease, etc. on the contacts. So the only thing I did was the removing and cleaning of the display and the contacts…. Thanks again, and I hope Henk reads this posting. Thanks for the report Eckhard. I’m glad it did turn out to be something simple after all and that your 87s are OK.
need help locating a push button for a fluke 8060A. i think it is light gray AC/DC button. Nice tip on the display i need to go try that on my other fluke. I’m sorry I have no source for buttons other than old non-working units you find on eBay or at yard sales. 🙁 At least all of the similar-looking Fluke models (8020, 8024, 8026, etc.) all have the same buttons. just did the cleaning of the zebra strips on my 73 iii fluke meter I noticed the display pcb pads were not very even, or missing solder so i either sucked off clean a couple, added a little fresh solder, even up the height of pads, cleaned pads as well very well with iso as well as zebra strips and glass. display nice and dark like brand new. Original problem was upper right corner symbols and upper right most digit very light others just evenly dim. Now like new! Thanks so much for a well written procedure. Glad you found the write-up useful and that your meter is working well again. This is a common problem with a lot of devices that use LCDs, but quite often it can be a simple repair. d to check the backplane drive, etc, but am flummoxed by the lack of data or service manual. Even the one single chip used, “UM7106” doesn’t google up; Has 44 pins, and data on other 7106’s shows only 40 and 42 pin smd packs. Nice multi, but have to live with this ghost display. How do I send you the photo? If I understand correctly, it sounds like a defect in the LCD itself. You can link to already-published (Flickr, imgur, etc.) photos with HTML, or you can send photos to the email address in the right-hand sidebar. That definitely looks like a problem with the LCD glass itself. It reminds me of the “bleeding” LCD problem with old Fluke 8050A and 8010A/8012A models. So. Thanks, that then is that. Any chance of transplanting from other (not Wavetek) ‘donor’s? Have several. A replacement LCD would have to have exactly the same size, layout and pinout. It’s possible that a model “family” from the same mfr. may share an LCD, but otherwise not much chance of a transplant. Thank you for your comment and success report. I’m glad you found the info useful. Glad you found the information useful, thanks for the kind comments. Thanks for the info. It just took 20 minutes and 2 euro to fix this annoying problem on my expensive tool. Today I fixed my Fluke 23 II Series. Some segments (incl. bargraph) didn’t show the full contrast. Now they do :-). Thanks for your kind comments, glad to hear of successful (and cheap) repairs. I have a little different problem. I have a Fluke 77II that lights up the entire screen when it is turned on, in all modes. Any ideas what could be causing this? Just revived my 28 year old Fluke 75 display with this method. For the last 9 years, I have wedged tiny wads of dum-dum (that sticky butyl windshield caulk) between the top of the case and lcd to exert pressure on the contacts. But in the Arizona heat, it ultimately oozes and flows releasing the pressure and requiring a reapplication. I have cleaned out black goo for the last time with this solution! Thanks for your concise info and photos. Il mio Fluke 83 è tornato nuovo! I just cleaned my Fluke 87 using your procedure. The result is just amazing ! The display was as bad as on your pictures and is now as nice as a new one ! On my Fluke 85 the the “b” segments dose note work. I think the problem is that the LCD Display ist broken on one edge. Did anyone know where I get a new LCD Display for the old Fluke? I just cleaned my Fluke 87 that I’ve had for 20+ years by this procedure. The display has had problems for a couple of years. Now it looks brand new. I hope it will last another 20 years. Thanks for the information. Thanks so much for posting this repair guide! I got my Fluke 87 back in ’92 and the display starting having the fading number problem a few years ago. I finally had some spare time and decided to see what I could find about the problem and ran across your site. Your directions and photos were top notch and easy to follow. Thanks again for taking the time and effort to share this information! Thanks, that’s good information to know that it’s mostly the PCB side. I never bothered to isolate which side causes the problem, if I’ve got it taken apart, I just do both sides to get the job done. Some people think the elastomeric connectors are glued to the LCD, but they’re not. They just get stuck from the constant pressure. Which is part of their function, to seal out contaminates. This post is a godsend. Thanks a million! My Fluke 189 won’t read current with leads in the 10A sockets. Always reads zero. But works fine in with leads in the 400mA sockets. So I opened it up to troubleshoot. Didn’t notice the two screws holding the circuit board to the front case, so I thought the white clips holding down the LCD must be holding down the circuit board, so like an idiot I unclipped them. Then I got smart and noticed the screws. Pushed the board down again, into the clips, and went about troubleshooting. Found nothing obvious wrong, and fuses are fine; put it back together and the LCD was a disaster. Took it apart and tried cleaning the zebra strips with my fingernails, which actually helped a little, but not all segments were alive. Opened it up and closed it about 5 times before getting smart and finding your blog. Took out the top zebra strip and cleaned both sides, and cleaned the top side glass (bottom strip was firmly adhered to the glass, so I didn’t mess with it). Took two tries, inspection with a loupe and tweezers to remove cotton fibers from the q-tips, but it worked! Still can’t figure out why the 10A doesn’t work, though. Glad you found the information useful. To my knowledge Fluke 189 schematics are not publicly available, which would make trouble-shooting so much easier, but anyway… Check continuity between the 10A and COM jacks with another DMM. Should be pretty much a dead short. That will verify the fuse, shunt, and hi-current PCB tracks. If that’s OK, then something must be wrong with the voltage sense line coming off the 10A shunt. Be on the lookout for a broken jack assembly, the 189 part can fail just like the 80-series. Also, this model senses whether the leads are in the 10A or mA jacks using split contacts inside the jack (shorting them lets the meter know there’s a plug present.) I think the meter uses that to switch the voltage sense line from the mA shunt to the 10A shunt. Make sure the display switches between A and mA as you swap leads between the current jacks. Thanks for the advice. I will try those things. I know the fuses are good. I tested them with a different DMM and they were about 1/4 ohm. I used the meter about a dozen times to measure current last weekend. The 10A setting worked exactly once; otherwise it read zero. The 400mA setting worked every time. The lead sensing circuit apparently works fine, even on the 10A socket. I’ll check it out and leave a follow-up post. I measured the resistance between the A/mA and Common jacks. I get 0.6 ohm and 2.4 ohm, respectively. Interestingly, the mA loop gets higher when the meter is turned off. I think the lead sensing tabs are ok.
A little high, but that could be your meter + leads. With a bench meter I get 0.027 and 1.82 ohms. The mA shunt is routed through the rotary switch so the difference there is normal. My Fluke 87 display flashes on and off and makes a slight clicking noise with each flash. Have any ideas what might be causing this? I’ve replaced the battery, tested the fuses, cleaned the contacts for the display and control knob. The only time I’ve seen this is when using a weak battery with high internal resistance. It powers the meters on, but as soon as the usual power-up backlight flash happens, the voltage drops and kills the processor, so the meter reboots in an endless loop. Theoretically a really bad battery connection could cause the same effect. I just used this procedure to fix the display of our elliptical, I first cleaned one side with no success but after cleaning both sides of the elastomeric connector with a little pressure, the display is back and good as NEW, Thank you for taking the time to write this and share your wisdom. Works perfect for my Fluke 83 all characters black again, Thank,s for sharing, you are a master!! I have a Fluke 12 DMM that is 25 years old. The buttons stopped working because an elastomeric connector wasn’t making good contact with the PCB. Cleaning did not fix it. The way I fixed it was to “touch up” the PCB with solder making sure that the solder on the contact points was a little thicker than original. The idea was to increase contact pressure between the elastomeric and the PCB. DMM works perfectly now. Thanks for the tip. Some models have polymer thick film contacts instead of tinned copper though. Many thanks for this helpful article. Following your instructions I pulled my model 83 apart and found that one of the pcb retaining clips was broken. I repaired this and carefully reassembled the DMM. All working perfectly now. 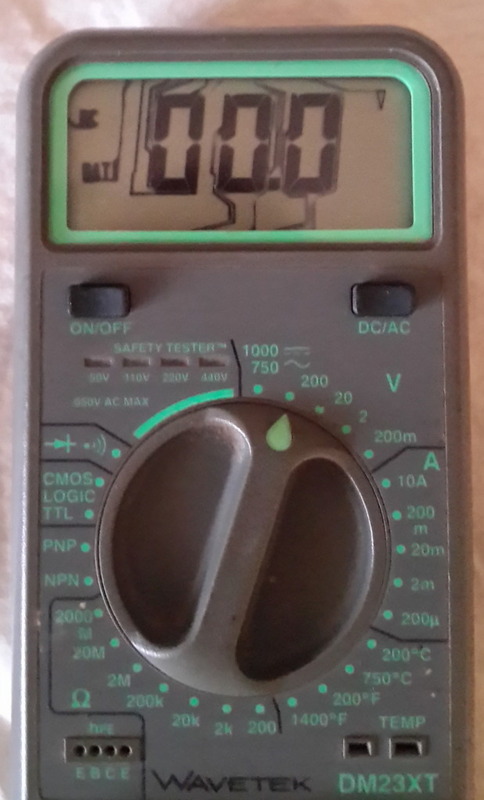 Have an 8020A multimeter,need one LCD display due to fuzzy state.Need contact in Canada to purchase one.Help. Would coating the mating surfaces with a very thin layer of some anti-oxide contact grease stop the problem from happening? Anyone tried it? I can’t see where that would work. A compound with dielectric properties would inhibit electrical contact and cause dim or missing segments. A compound with conductive properties would lead to crosstalk between adjacent segments, garbling the display. Clean surfaces and pressure is probably the best thing. I am going to use your LCD display cleaning procedure since I have some minor LCD contrast issues, but the main problem I am having is that the display flickers endlessly. I am assuming it is the “test mode” code switch issue and/or a contact issue with the function selector switch. I intend on doing the LCD repair procedure, contact cleaning of this “code switch”, and cleaning of the function selector switch contacts, followed by a new battery. However, if there is anything else I should check while in the case, please advise. In the past 10 years I have simply cycled the selector switch a few times and periodically changed the battery with success but no go this time. Cool site, excellent dialogue and advise. Thanks. Sorry I missed your question on first read… It sounds like you have a good plan. But it’s always good to inspect the entire PC board closely with magnification to look for contamination and damage. Great Instructions. Got an older Fluke 8060 back in service. This one will go to my 26yr old son for Christmas with Prev. Maint. instructions. I had the same problem… By my Fluke 83 from 1995. I’ve done as in your description. I’m very happy about it. Fluke 83 had this problem. Instructions and photos were great and now my meter is working again! Thank you!! Just finished this procedure on a 20+ year old Fluke 85. Came back to about 95% now. Thanks for the tech info. Works a lot better now. No more guessing…..
the 4 button’s dind’t work at all, but now they do. RE: display stays on after cleaning and reassembly. The detent for the rotary switch is in the knob on the cover, not on the board. It is possible to inadvertently rotate the switch on the board while cleaning the contacts on the board, so the knob is not synced to the switch. If you have this problem (I did), look in the right upper corner of the display for the indication of what function the instrument is in. Remove the cover and rotate the knob until it indicates the function shown on the display. Reinstall the cover, assuring that the hex shaft of the knob assy fits smoothly into the switch. Turn the knob to off and the meter should be off. Cleaning the contacts certainly saved me money and downtime. Thank you very much. Thanks for those suggestions. Also, if you look closely the switch hub has a little pointer. If you set the knob to OFF, and then rotate the pointer to the same angle (there are guide marks in the plastic), you’ll be good to go. No it will not damage the display. The reason for the advice is that the connectors usually deform to match the uneven pads on the PCB, so it’s best to put them back in the same position so the “hills and valleys” will match up again and not cause connection issues. On my Fluke 83 and with the power off. I hold down on the blue button and turn the meter on to the ac volts modes. Everything lights up on the display. Someone on the internet said to try this to check the display. My problem is sometimes it will display dc in the ac mode and all the modes. And one time it display ac in all the other modes. It reading the right volts in the modes but display the wrong sign. I thinking i need new strip but everything display on the test. What do you think? Thanks for all you help. Fluke is no help with a meter this old. If all LCD segments look good on the power-up test, then the elastomeric connector strips are OK. The other symptoms you describe may point to the code switch on the back side of the PCB. This switch tells the microprocessor which mode to be in. Look up “rotary switch test” in the manual. Everything look good except the ACV & DCV my reads 0477 , It suppose to be ACV 0 & DCV -32. So do you think the rotary switch needs cleaning? Or something else. Thank you for all your help. And again another happy Fluke user! My Fluke 85 LCD had gone weak and I was searching for a new LCD when I saw this. After cleaning the PCB contacts a bit, the old 85 got a new life, thanks a lot! I have a radio shack 22-178 digital multimeter. Apparently same as Micronta 2A2. Haven’t graduated to a Fluke yet! The screen will show the top half of the digits and immediately fade when the power button is depressed and released. Thru the process of my disassembly-reassembly a half-a-dozen times the bottom half showed up by itself as well and then faded. Followed your directions on cleaning the zebra strip, glass, and contacts. No difference. New batteries, power button works, nothing looks scorched, swollen, or disfigured and no burnt plastic odors. PCB is clean with no corrosion. Took the display out of it’s plastic housing and pushed the elastomer strip firmly against the contacts. No difference. I am starting to think that either the LCD screen itself is faulty, or more likely the microprocessor that feeds the screen. That’s my uneducated guess. Any simple way to check to see if they are working or not? Have you come across parts for older multimeters that are currently still available? My Fluke 87 from 1988 has all segments crisp and dark again — thanks for these excellent instructions! Sir, I have a flukeET88 bought in about 1992 mostly for automotive use. I sent it back once under Warranty for missing segments on the display years ago. It has sat unused for quite awhile, ( no battery in it ), I recently installed a battery and again lots of missing info on display. I found your article on line and tried your cleaning procedure. I was skeptical at first because when I dismantled it I had none of the discoloration you described. I want to thank you because when I put it back together it works like new. I have a new meter again. Thank you for your rite up very professional and easy to fallow. Dave from Akron Ohio. Good job on the repair, and thanks for the kind comments. Be prepared to repeat the procedure in a year or two, but now that you know how, it should be easy! It took a lot of careful cleaning. Cleaning just the PCB and PCB side of flexible connectors did not help. The tip to use tweezers is a good one. Keep cleaning until the swabs don’t pick up any more black. I had bought a Craftsman multi-meter when this Fluke 87 started having display problems. I found that it reads about 20% high so I decided to check google. Thanks! I wish I’d have done that a couple of years ago and glad I didn’t throw the FLuke away. I began to notice the “fading” on my 73 III during a recent debug session. I’d replaced the LCD a few years ago due to physical damage (segment “bleed”). All worked well. I was hoping that the problem was poor connection between the elastomer and was headed in that direction when I stumbled on this article. As it described the exact thing I was experiencing, I figured there was a good chance of success. And success there was! Thanks much for posting. …should have noted that I cleaned only the PCB side. Thanks for the detailed instructions. Just revived the LCD on a Fluke 83 following your guidelines. Didn’t need to peel the zebra strip from the glass (was also a little apprehensive about doing this in case I couldn’t re-seat it in the same place). I have a faded display with a fluke 75, the old one. as you said polarizer was defective. I tried to get a new or used display without success. but I realized that using a linear polarizer the digits were visible. I peeled off a polarizer from a cheap non working dmm and put over the display (under the lcd plastic cover) and it worked and still work ok.
Had the dim digits and flaky off position. Cleaned board with 91% and the back side rotary switch, back in business. Thanks MrModemhead! Thanks for your great description of this procedure! I have an old 85. Problem when I turn on to any setting the display shows everything, all segments highlighted. And does not work check voltage or anything. It sounds like the meter is hanging up during its power-on sequence. I’m sure there are many faults that might cause that, but for starters try something simple. The “code switch” on the back side of the PCB is responsible for handling the power-up and range selection signals, so inspect that and try cleaning it with strong isopropyl alcohol (IPA). Check this post about switch cleaning, especially toward the end.